I am on a personal crusade to change the image of quiche. People think of it as a menu item for a ladies' brunch. And that's pretty much it. But it's got so much more potential than that! 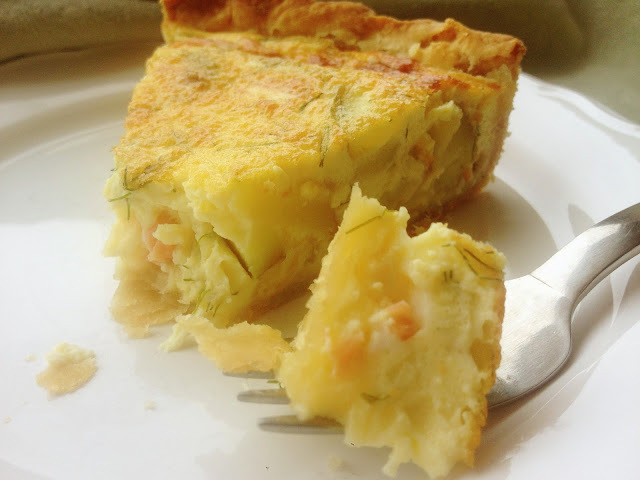 of quiche using whatever meat and veggies we had in the fridge. Kielbasa and onion? Great. Ham and peppers? Sure! Zucchini and sausage? Why not! Everyone always loved it. It's also a very forgiving dish. If you are missing an egg or two, it'll still turn out fine. Add an extra egg? Still great. Want extra cheese? Less cheese? Yummy either way. (Although I'm always going to side with the extra cheese folks out there. Just the way I roll.) Add lots of herbs, a bit of garlic, whatever flavor strikes you. You want to use a pre-made crust? Okay. My gigantic feed-the-orphan-quiches I used to make with something similar to puff pastry, because that's what I could get in the store when the hungry hordes did not allow me time to make my own pie crust. 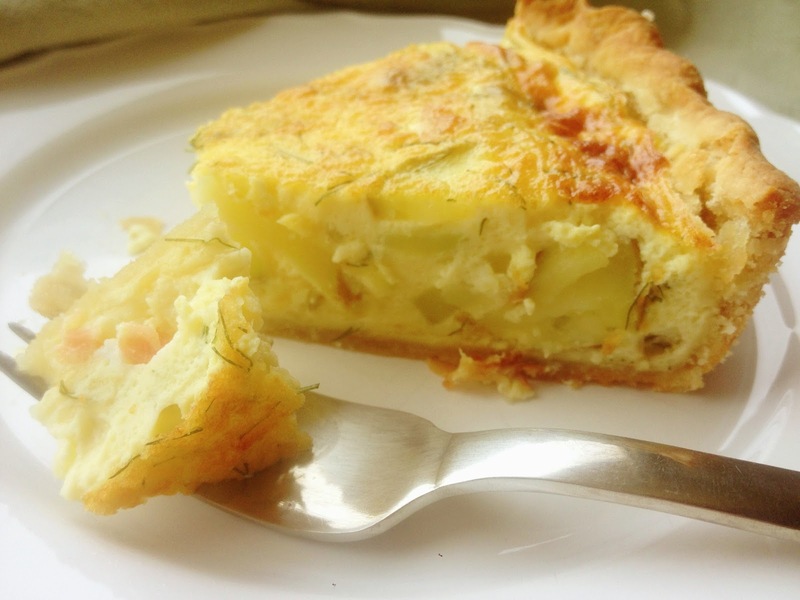 Recently I had quiche on the menu, but I was out of bacon (obvious first choice of filling) and not willing to drive an hour for more. Shopping in my little local store in the town up the road, I spied a nice-looking piece of salmon. All by it's lonely self next to the cheese. 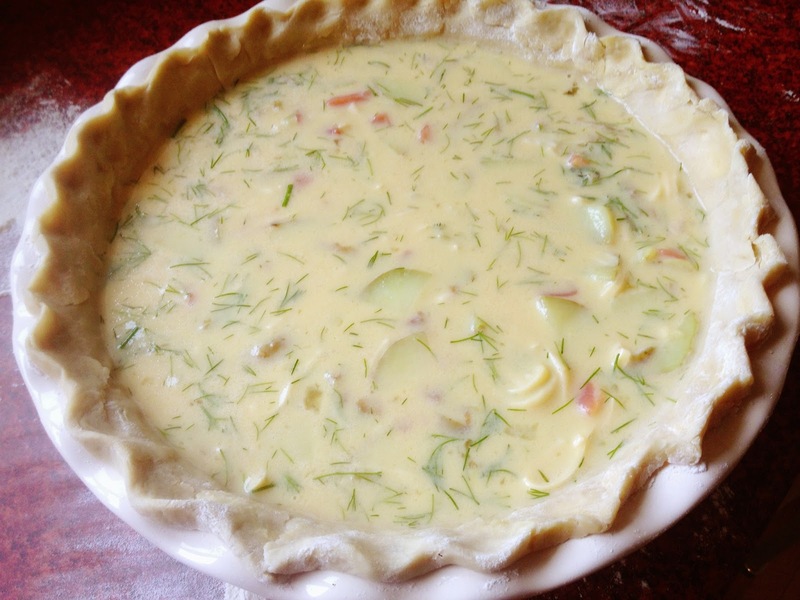 Hmm, I thought to myself, what about this in quiche? What else could I throw in there? Potatoes, I've always got potatoes. And, of course, living in Ukraine, I had to grab some fresh dill. 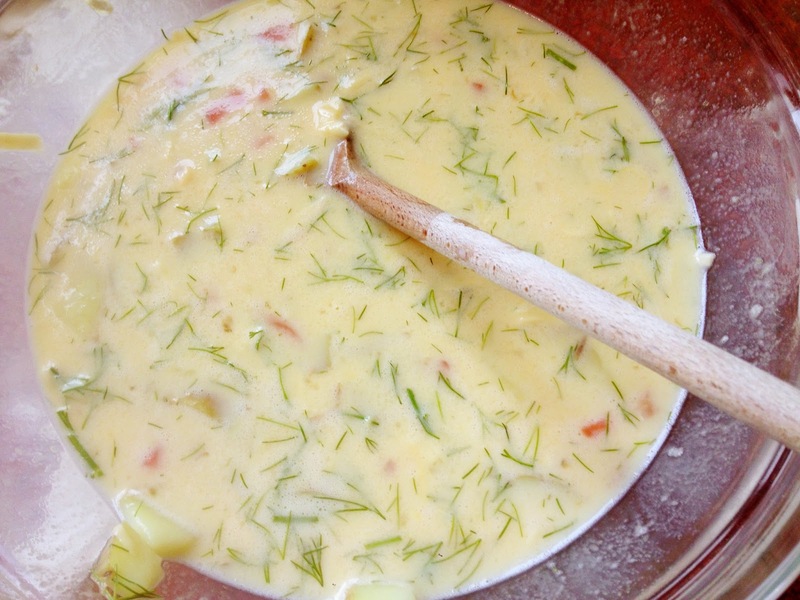 (Something in the air here makes people compulsively add fresh dill to almost all food items). It turned out lovely. So try it this way. Or go with what you've got in your fridge. It'll be delicious either way. And if you've got any teenage orphans around, I promise they'll love it. First you need a pie-crust. 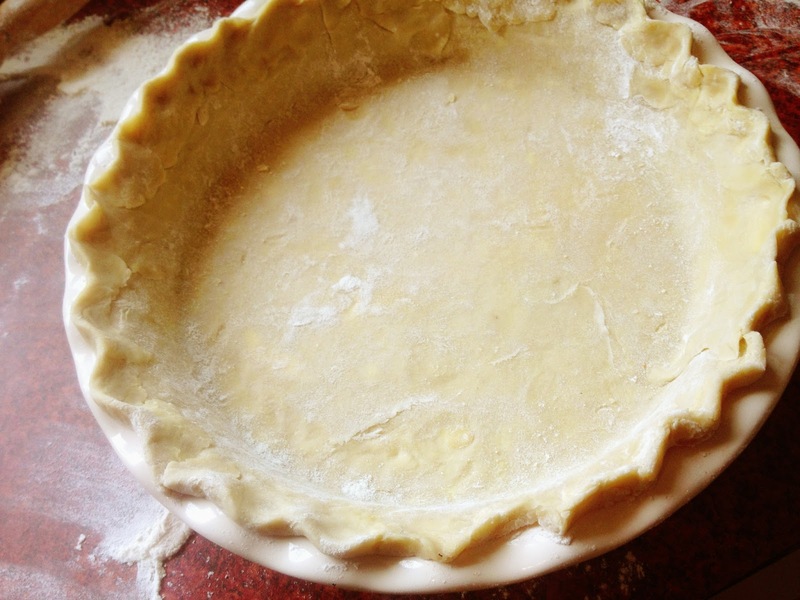 I made this crust with my standard pie-crust recipe, which you can find HERE. Use your favorite recipe, or your favorite store-bought crust if you must. Next, slice and boil some potatoes. I ended up with about a cup and a half of the cooked potatoes. Now take your salmon. This is what I used. Here it's called "weakly salted" salmon. I wouldn't go with the "strongly salted", that would be too much for me. 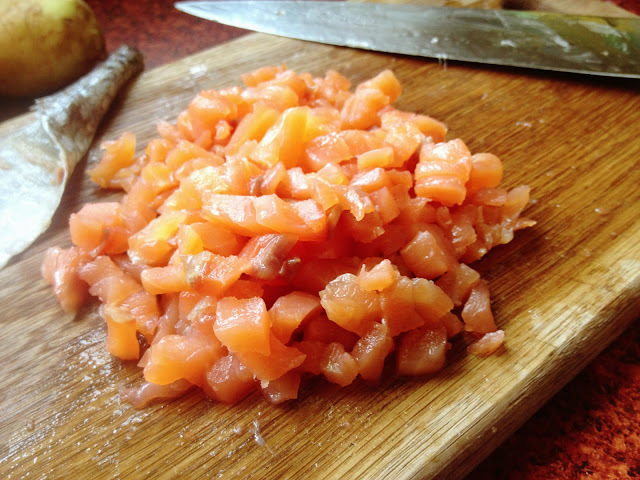 This is a lox-type salmon. I'm pretty sure that's the closest thing we'd have in America to this. You could use lox, which in America is pretty expensive, or I'm sure you could easily substitute smoked salmon or regular cooked salmon. Or, you know, whatever you've got in your fridge. 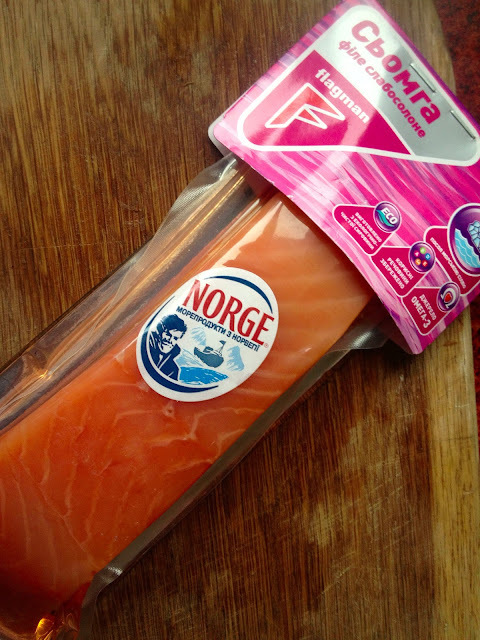 Now chop up your salmon. It's pretty salty, so chop it into small pieces. You don't want to get a huge bite of the saltiness. You want just enough for that nice tang of flavor. Oh, and remove the skin. Give it to your cat. He'll like you for the next 10 minutes at least. 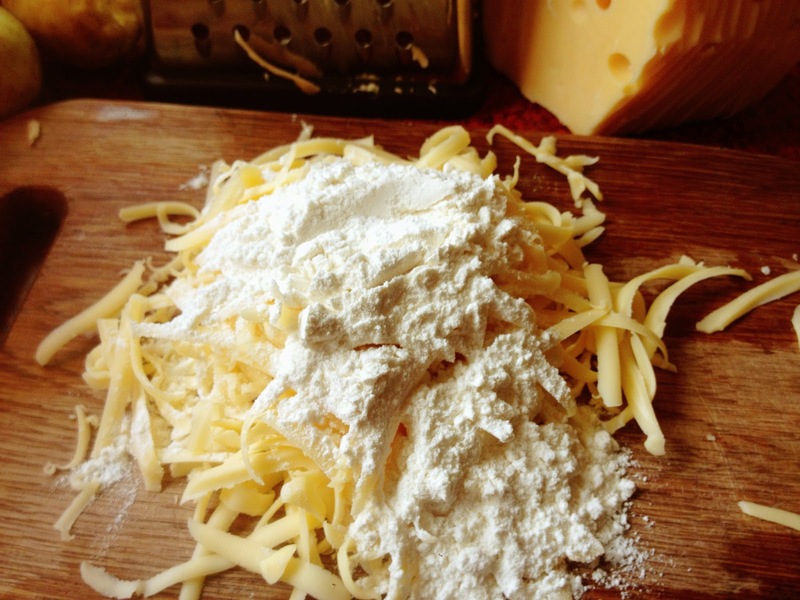 Shred your cheese, and toss the flour on top of it. 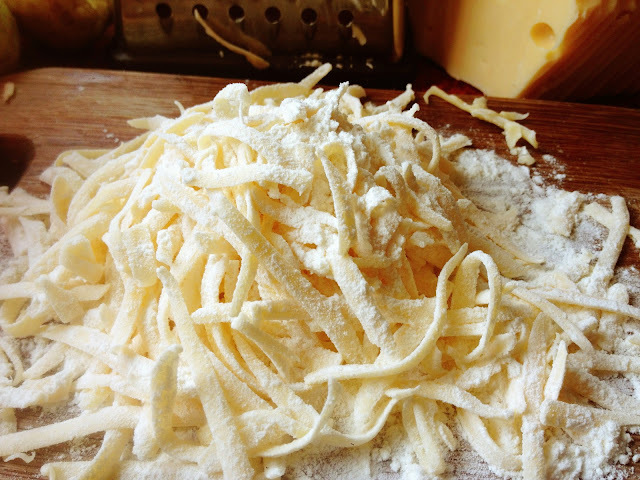 Toss the flour with your hands into the cheese, so the cheese is all coated with flour. Now whisk up a half-dozen eggs or so. 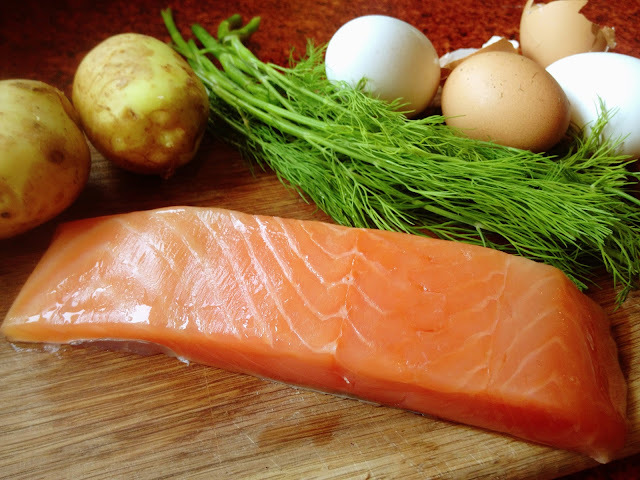 Toss into the eggs your flour-coated cheese, the salmon, the cooked potatoes, and some nice rough-chopped fresh dill. Stir it all up nicely and add some milk. Pour the mixture into your crust. Bake for about 50-60 minutes, or until there is no jiggly spots. Slice. Eat. Serve at a ladies' brunch. Or just treat yourself to a nice lunch. Or snack. Or make a few pans and have some orphans over for dinner. 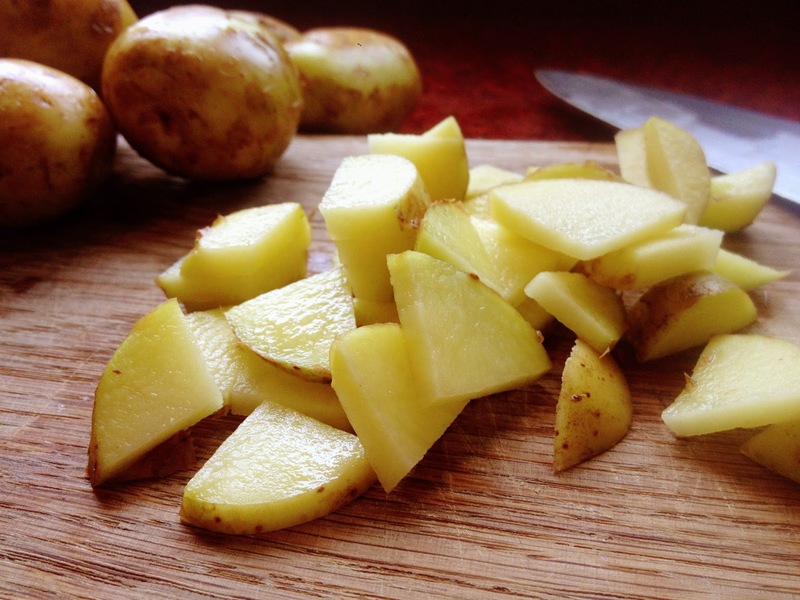 Slice and boil the potatoes. Chop the dill and salmon, shred the cheese. Toss the flour together with the cheese. 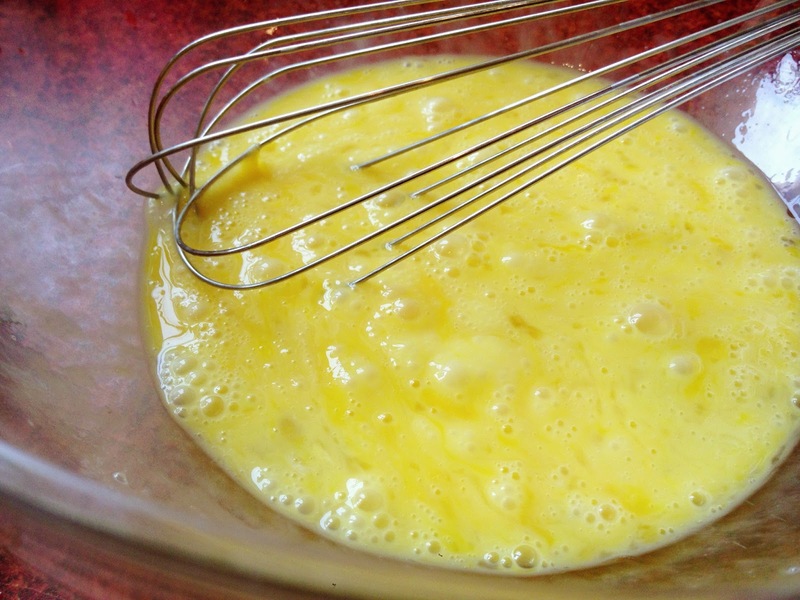 In a mixing bowl, whisk the eggs. 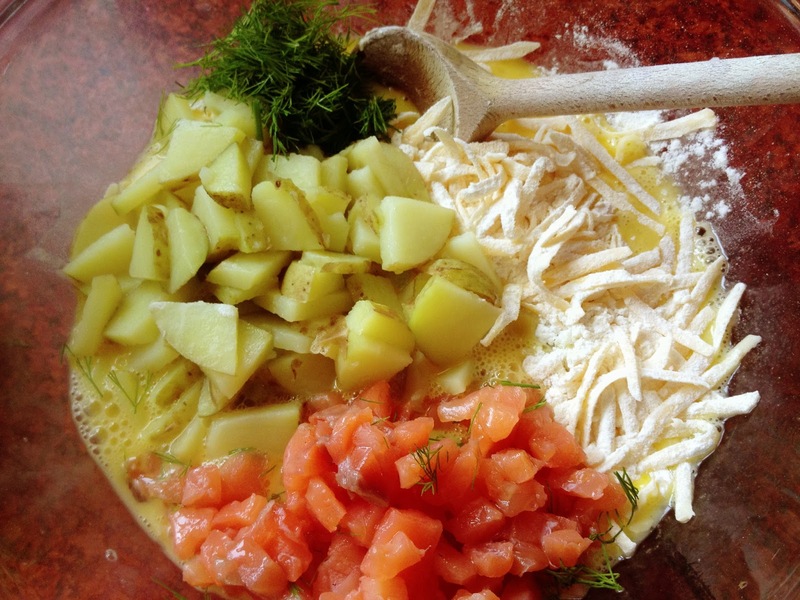 Add the dill, potato, salmon and floured cheese. Stir til combined. Add milk and pour into crust. Bake 350F (= 175C) for 50 to 60 minutes or until top is golden and filling doesn't jiggle in the middle. Jenny, I've never made quiche. I like the way you make it look so simple. Have to see if I can find some crust at the store. You're doing a great job on your blog. Nice pictures too. I love pictures. Thanks, Colleen. 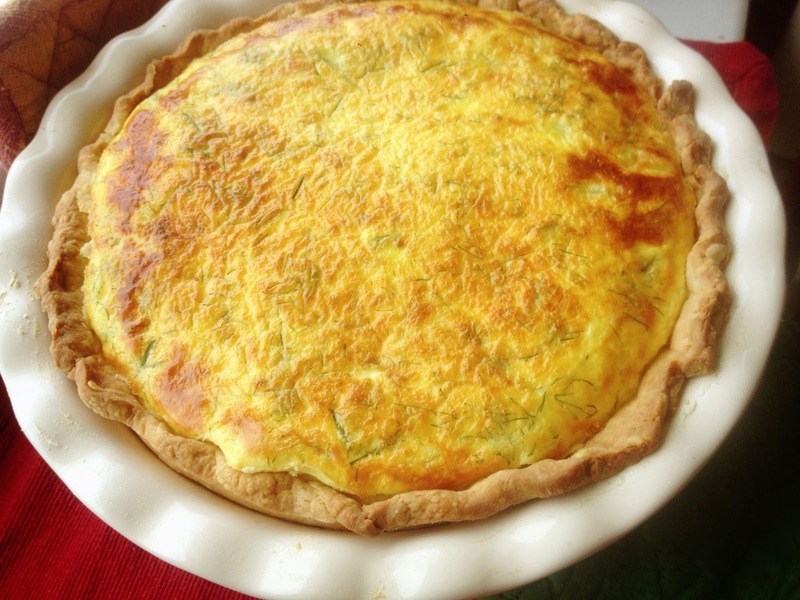 I hope you try the quiche, it's really not as hard as it seems. The crust I have used here is листковий. It's like a puff pastry. 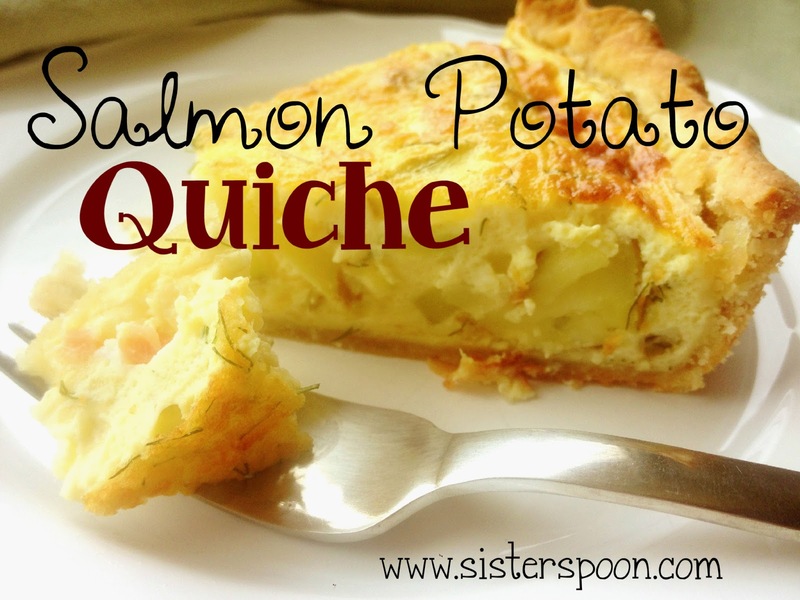 It isn't the same as using a pie crust, but still delicious (and quicker)!